With a long list of sub-ohm tanks flooding the market, it’s easy to forget that not everybody wants or needs a sub ohm capability. Plus, sub-ohm tanks are not the best option for mouth-to-lung style vaping. 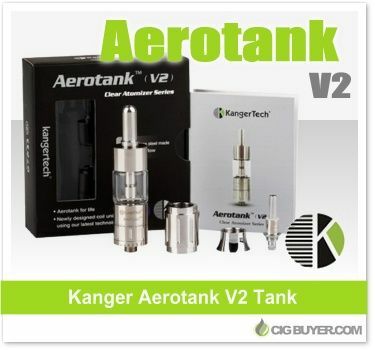 Whenever we get asked to recommend a good non-sub-ohm tank, we often recommend the Kanger Aerotank. V2 has newly improved dual coil heads, updated adjustable airflow, 2.8ml of e-juice capacity; along with quality stainless steel and pyrex glass construction. * No special coupon code is available. Deal good while supplies last.